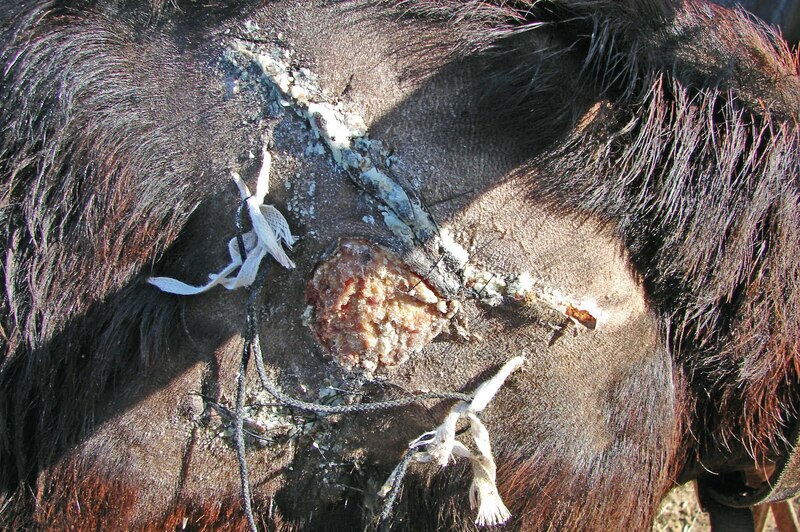 On December 23, 2009 our buck, Bucky, ripped several inches of skin off his shoulder. I had gone out to feed when I noticed that his shoulder was bloody. Upon closer inspection, I found that a strip on his shoulder about 10 inches long and from 2 to 4 inches wide was missing. AWK!!! MISSING!!! Bob and I searched everywhere for the missing hide but couldn’t find it anywhere. Needless to say, I was on the phone to our vet. With goats, your vet should be on speed dial. She’s a 7. We decided to take him to her hospital because it was about 20 degrees in the barn. She sedated him then started sewing him back together. Yup, she found the skin. Luckily it was still attached but had folded under his skin. Following are photos as of January 5, 2010. 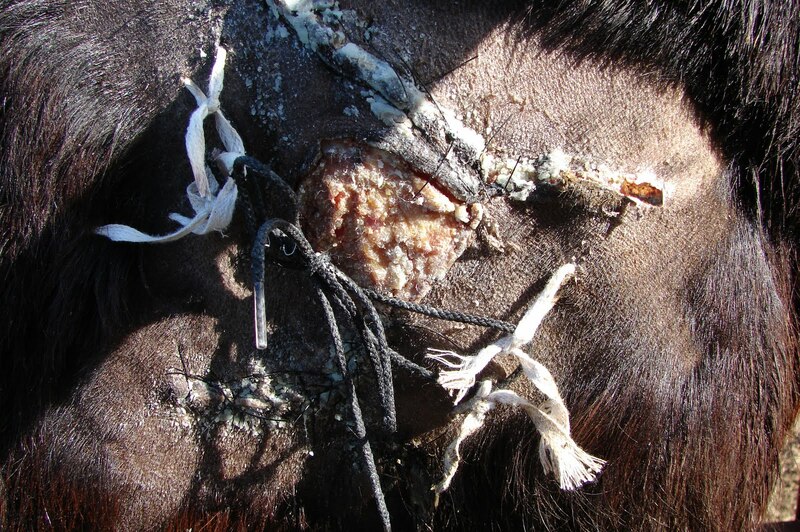 EVERYTHING is covered with a chlorhexidine-medicated salve to help keep his would clean. All-things chlorhexidine are wonderful. I say ‘help’ keep his wounds clean because, hey, it’s breeding season and there are clearly no ends to which a buck will to go reach his does. Sigh … . 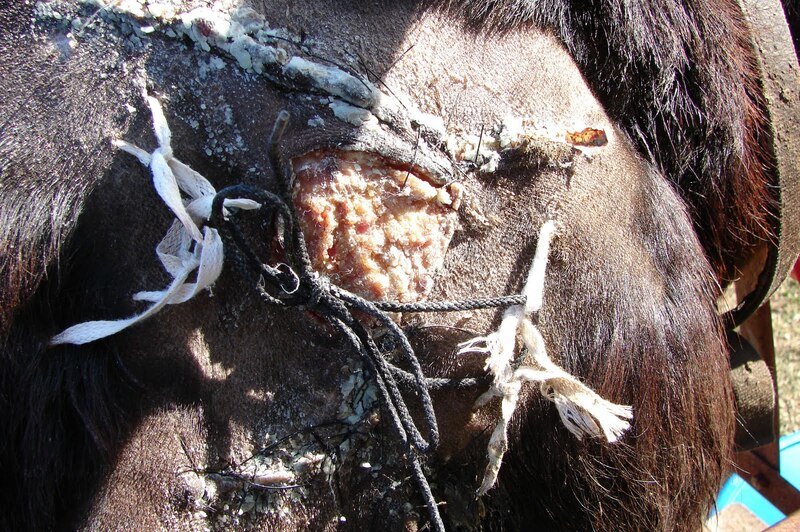 On the shoulder part without skin, I thoroughly cleaned it daily with warm water and a surgical scrub, coated it with a heavy layer of salve, covered with gauze, then secured the gauze with a clever bandage devised by Dr. Betka. 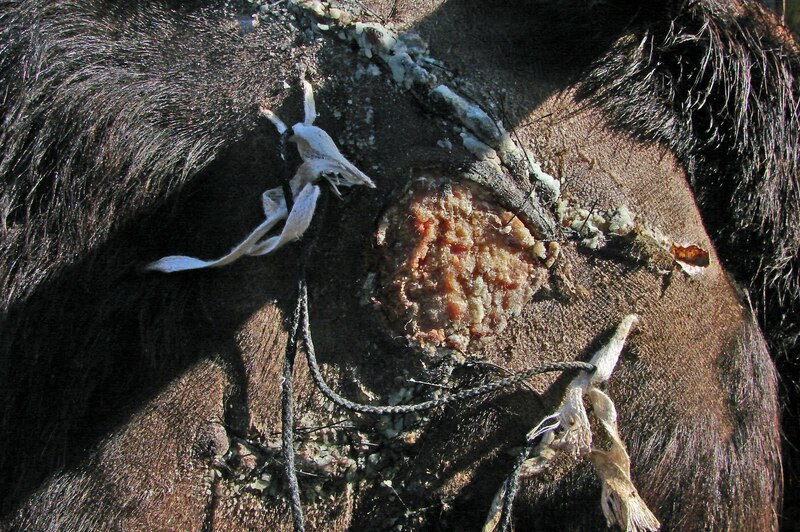 The strings you see are for a ‘shoestring bandage’ that helps hold the gauze cover the raw muscle. After covering the wound with gauze, I gently tie a shoestring criss-crossed over the bandage to hold it as securely as possible. It works! Well, most of the time he leaves it along. His stitches look good; he has no fever, and his energy level is as high as ever. Bucky has been our main buck for years and although this is his first/only major injury, we’ve decided to nurture a few more bucks as replacements. He’s given us several handsome boys that are vying for the job. Yes, we’re late in the breeding season but health first is our motto. Besides, I prefer late spring babies anyway. I like that the babies will be inside their mama during the LAST frost. He might have caught his hide on a blunt bolt used to hold the fences. Ohmygoodness, a blunt bolt did this?We'll search again and cover the ends with a rubber hose. Thanks for the suggestion.